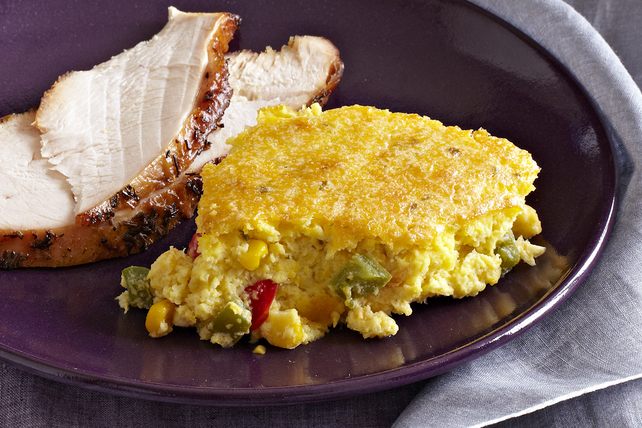 Packed with the flavours of sweet peppers and herb and garlic cream cheese, this delicious corn casserole is an excellent side dish to serve with baked chicken. And as a bonus, it makes enough to serve a small crowd. Mix cream cheese product and margarine in large bowl until blended. Add eggs and milk; mix well. Stir in all remaining ingredients except peppers and 1 cup corn. Add cream cheese mixture, in batches, to blender; blend until smooth. Transfer to 13x9-inch baking dish sprayed with cooking spray; stir in peppers and remaining corn. Bake 50 to 55 min. or until toothpick inserted in centre comes out clean. Let stand 10 min. before serving. Add 3 sliced green onions to cream cheese mixture in baking dish along with the peppers and remaining corn. Process the cream cheese mixture in a food processor instead of the blender. Prepare using Philadelphia Chive & Onion Cream Cheese Product or Philadelphia Garden Vegetable Cream Cheese Product.